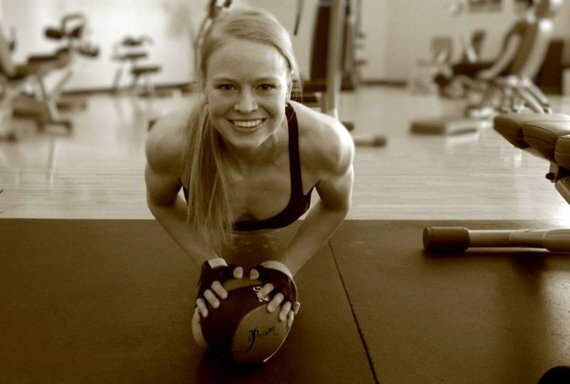 Fitness and healthy living were ingrained into Mikayla from birth. Heck, her mother fed her flaxseed oil instead of sugar! This Canadian cutie has taken fitness to an even higher level. I have always been an active person and loved the sports world! I started riding horses at just nine months old when my parents put me on a horse, and as my mom use to say, "I just never got off." 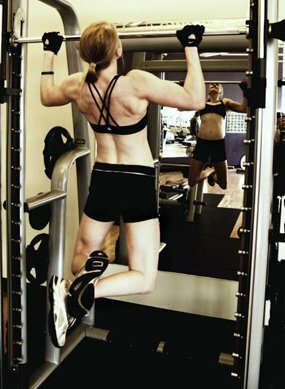 I competed in a three-day event and participated in the BC Champions when I was 16. It was then that my mom and I decided to hire a personal trainer to help with my riding, fitness, and nutrition. Shortly after that my horse injured his leg and his and my event career was over. It was my trainer, Charlene SanJenko, who told me about the fitness and figure world. At the time, I had never even heard of it! One year later, I participated in my first fitness model and figure show when I was 17. My workouts change depending where I am in my training and what my goals are. Right now, I'm in the offseason, so I'm trying to gain muscle, but also stay fairly lean. I find lifting weights 4-5 days a week, followed by 30 minutes of cardio works for me. I do four sets of 10-12 reps, with my last 1-2 sets going as heavy as I can with either 8-10 reps or drop sets. I try and mix up my routine every 1-2 weeks so I don't get bored. When I'm not dieting down for a show, I still eat healthy. If I feel like having a treat, I'll have one, but I try to keep my treats or cheat meals to Sundays only and eat good the rest of the week. I eat every 2 1/2-3 hours. I don't always eat the same thing every day, but this is what a typical day would look like for me. Depending on my schedule, I'll mix up my meals if I am on the go. A protein shake is easier to grab on the go than steak and veggies. I find my body does best on Vega Sport Performance Protein. I have a shake post-workout and one as either a morning or afternoon snack. I also take a multivitamin, chromium picolinate, vitamin B, E and D with Meal 1 and a multi vitamin and vitamin B with Meal 5. My mom had me living a healthy lifestyle since I was very little. I don't think I tasted sugar until I was at least five. I was the only kid who begged my mom for more flaxseed oil because I thought it tasted good! My family is very supportive. 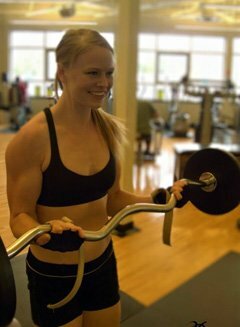 My trainer, Charlene SanJenko, has been there since day one and promotes a healthy lifestyle on a daily basis. She keeps me going, especially when I'm dieting down for a show and want everything in sight! I love Arnold Schwarzenegger's 6 Rules Of Life speech! I listen to it almost every day, especially on days when I feel weak or tired. I often hear his voice saying, "You have to work hard. Leave no stone unturned. When you're out there partying and horsing around, someone out there at the same time is working hard. Someone is getting smarter and someone is winning. Just remember that." Hearing that always wakes me up and gets me motivated again! To continue competing in figure. I'm hoping to qualify for the BC Provincials next year followed by nationals. I would love to earn my pro card. I would also like to get into fitness modeling and one day model for Oxygen! Don't be afraid to ask for help or advice from other bodybuilders. You can never learn too much! There are many competitors that I admire. Nicole Wilkins is definitely one. I love her grace, beauty, and overall physique on stage. I refer to Bodybuilding.com as my bodybuilding bible. Whenever I have a question about a supplement, show prep, recipes, posing advice, etc, I go to the site and search for what I need. I always found the information I was looking for.